Flash Sale - 2nd Chance ! 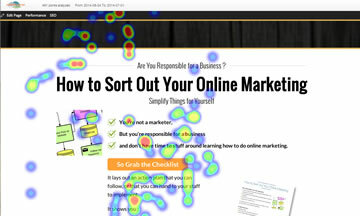 split-test your ads to find out what's working best - strengthen that and eliminate things that aren't working. You'll get a 30-minute coaching session on the 1st day, then 15 minutes each day after that as needed to get your campaigns up and running effectively. Instead of 2 instalments of $470 for a month's coaching, we're reducing it to ONE. This 50%-Off deal is ONLY for a limited time. I look forward to helping you get easier and faster results with your Facebook advertising. Click the PayPal button below to lock in your coaching & I'll email you soon to get started. We'll make our heat-map tracking software available to you, free for 3 months. Watch recordings of people and see if they make it to your buttons and calls-to-action.